There is hay season, where we are putting up hay for all the livestock we get to feed all winter, so we have good livestock come hunting season. There is a short but painful “shoeing season” where we need to shoe all those cayuses we fed all winter, which ends with shoe pulling and trimming for winter season of course. There is “booking season”. You know the one. Where outfitters are slaves to their phones, emails and Facebook looking for those daring hunters willing to say, “I think I believe all your B.S. and I am going to send you some of my hard-earned cash to prove it”. 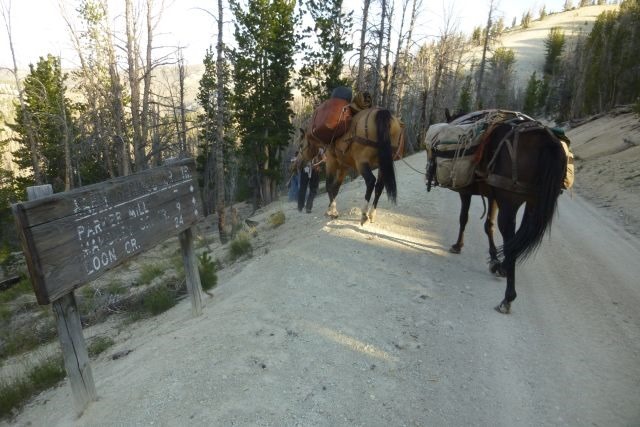 There is bear baiting season, where we ride literally hundreds of miles setting bear baits out throughout the wilderness so that we can (hopefully) entice some hungry bear into a lucky bear hunter’s sight. 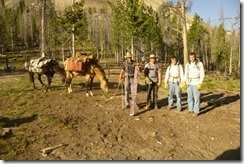 And today… today began “trail clearing season”. That is where a good outfitter invests money into the public lands system so that ALL people can access these public lands. Now I can hear it already, “It is in the outfitters best interest to clear the trails he/she uses”…well, DUH! But, here are the facts that follow a statement like that. These are PUBLIC lands. Meaning they are owned by all. If (we/our trail crew) clears a trail and someone (ANYONE) from the public walks in behind us on this newly cleared trail, do you know what they owe or even invested in their public land experience? NOTHING. 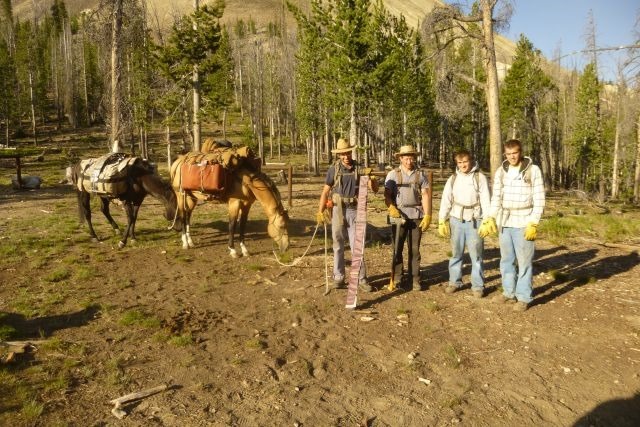 They are the beneficiary of others’ hard work and they are better able to enjoy their back-country experience because someone DID take the time to clear the trail they chose before they arrived. Now if you think I am patting outfitters on the head, you are missing the point of this message. What I am saying is that ANYONE who invests time, money and effort in clearing “OUR” public lands access points, be it a fallen tree on the road to a trail head or the back-country efforts going on right now in “The Frank”, that person is creating and leaving a legacy for others to enjoy. I am incredibly proud of the work these young folks do each year. Some of the faces change, but the enthusiasm for spending time in one of America’s “Crown Jewels” and “giving back” to society, willingly and with a smile, does not! Thank you trail crew and good luck with the rest of the “season”! If after reading this, you find yourself wanting to “give back to society” by helping to clear trails, contact us. We are biting off some major projects that are going to take some super human effort to accomplish and we are looking for volunteers to help in this effort. So, if you have a few days to spare and want to work hard, get fed well, see country that not many actually get to see because of it’s remoteness and ruggedness and KNOW that you are leaving a legacy for others to enjoy, get hold of us. 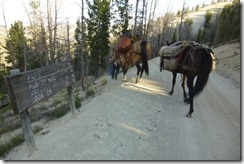 Our trail crew will be here until mid-August and about week three, we will really be looking for more help. We cannot pay volunteers, but we will provide a comfortable camp and more food than you can possibly eat in one sitting. What are you waiting for?